I wrote an article a short time ago, about the ease of getting started in karting compared to other motorsports. Although the majority of the readers agreed, some of the first comments that came up where about how challenging it would be to get transportation to get the kart to the track. While getting your kart to the track is something you will need to take into consideration, it’s not an impossible challenge. Besides, if you’re going to be racing, you’re going to need to have a method transport your race vehicle to the track in pretty much all cases. Fortunately karts are small and lightweight, which provides racers with several viable methods to get them to the track, even on the tightest of budgets. It’s important to figure out how to get more racers to the track, so below are just some of the different ways that you can transport your kart. 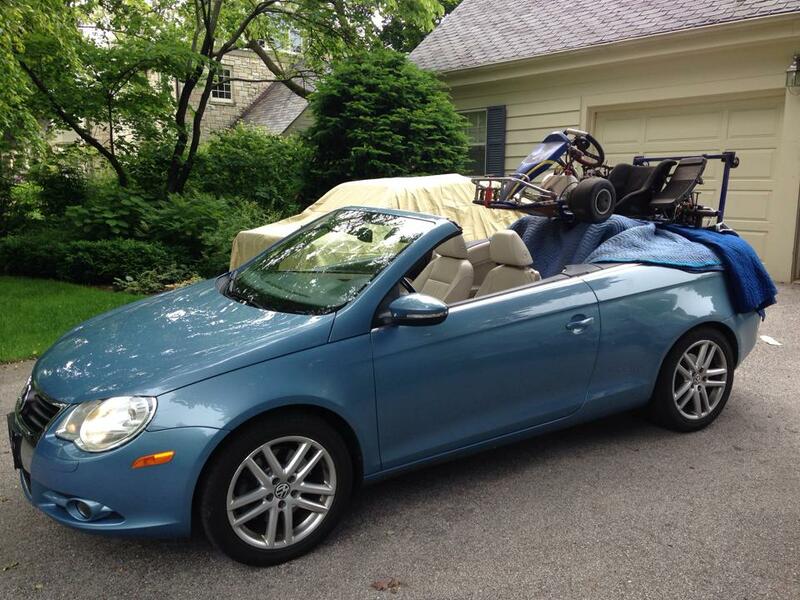 The above picture is ridiculous and probably the worst example of transporting a kart on the roof of a car. This isn’t a method that I would recommend, but it can be done. But by mounting the kart on the roof of a car, there isn’t a need to purchase a tow vehicle. This, of course, is entirely dependent on the type of car that you already own. Some vehicles have the kart mounted on top of a ski-rack, but there is still the logistics of having to lift the kart on top of the vehicle. In this writer’s opinion, that isn’t as fun to do after a long day of racing. There are also some risks of damaging the car or the kart, when you try to strap it to the roof. This is the least expensive option for transportation. However, there are more cost effective options if you are willing to be a bit more patient. Cost Range: Roof rack, tie downs, plus a blanket to protect the paint of the car. Pros: No need for a trailer or any towing at all. Cons: Requires you to lift the kart on top of the car. Several straps. Potential damage to car’s paint. Logistically challenging. By having a light trailer, for example that you can purchase from Harbor Freight, it allows you to use any vehicle for towing, as you can see in the picture above. Loading the kart on the trailer is much easier than placing it on the roof of a car. 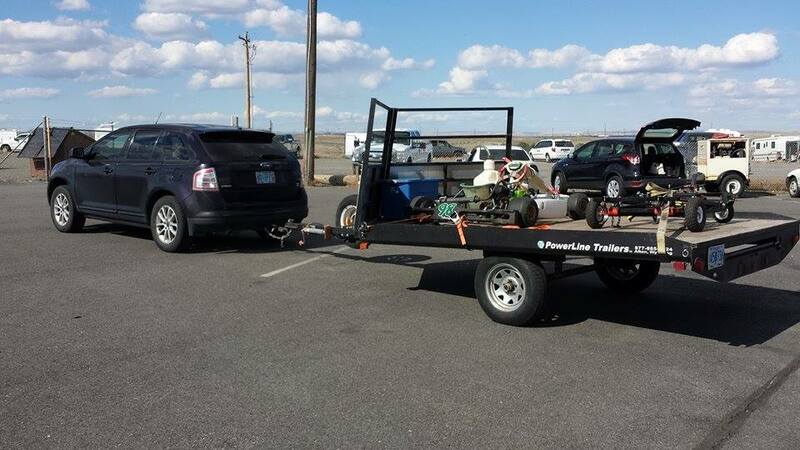 However, light trailers don’t typically come with any covering to protect the kart from the elements, and without making some custom add-ons, all of the additional karting equipment would have to be stowed in the tow vehicle. The trailer has to be constructed yourself. Although for the cost and relative ease of storage, a Harbor Freight trailer is a hard option to beat when you’re racing on a budget. Cost Range: $370 dollars from Harbor Freight. Pros: Allows you tow trailer behind pretty much any vehicle. Harbor Freight trailers are small and lightweight. Allows racer to load and unload kart with a single person. Cons: No space to really carry any additional tools. No cover from the elements. Trailer is not designed for large towing capacity. Used passenger/cargo van with rear seats removed. For those with a slightly larger budget, and do not wish to tow a trailer, purchasing a used cargo van is a viable option. By removing the rear seats, the kart slides into what is now a full storage area. The kart is protected by the weather, and by having side doors, the racer can load other equipment in easily. A van also provides the added bonus for the driver to provide a covered area for the driver to change clothes, and sometimes sleep in. 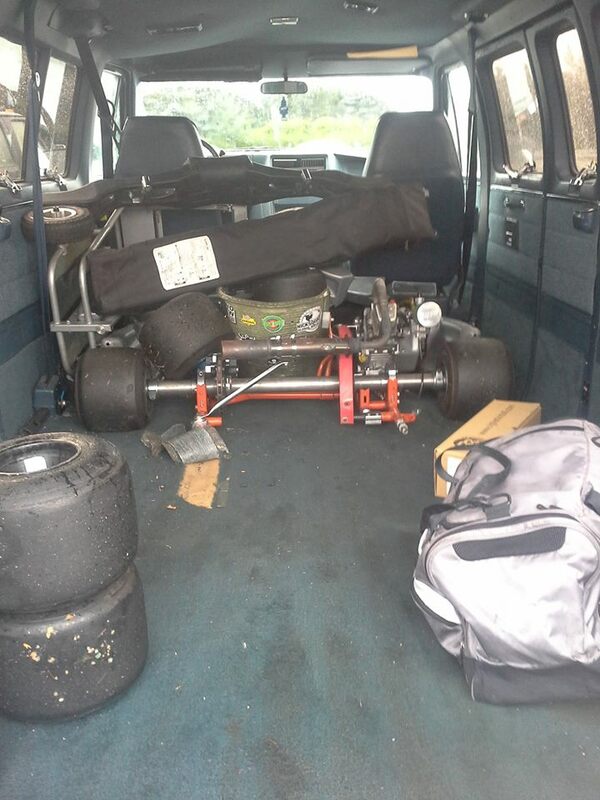 Craiglist is a great place to look for vans for karting. Some good examples of models to look for are early 90’s GMC Rally Vans and Ford E250 vans. Be sure that you measure the width and length of the kart and the van bay before purchasing, just to make sure that the kart will fit. Additionally, be aware that due to the ride-height of most vans, it will require two people to load the kart in and out easily. You can also fit a kart in the back of a full size SUV. But you will need to remove the wheels and side pods every time which becomes tedious. And you still need someone to help you load it. After time your SUV will smell like kart fuel and tires but if you already own a large truck, it will work and get you started. Pros: No tow vehicle required. Kart is covered from the weather elements. Covered space for driver to change clothes, and sleep if required, once pit area is setup. Cons: Expense of purchasing a second vehicle, plus licensing, insurance etc. Some vans will require you to remove the rear wheels of the kart to load. Typically it requires two people to get the kart easily in and out. A fully independent trailer is always going to push the upper edge of racing on a ‘budget’. It will require a vehicle to tow the trailer, as well as a place to store it. It is clearly the most expensive option. However, the advantages of having the storage ability and functionality of a completely dedicated space to store the kart and the equipment is really hard to beat. Plus most trailers will have the ability to tow more than one kart, so you can rent the space out to people and make some of your money back! Pros: Completely independent space for kart and equipment. Kart is covered from the weather elements. Covered space for driver to change clothes, and sleep if required, once pit area is setup. Cons: Expense of purchasing trailer. Expense of purchasing a second vehicle for towing, plus licensing, insurance etc. Location will be needed to store trailer and tow vehicle. 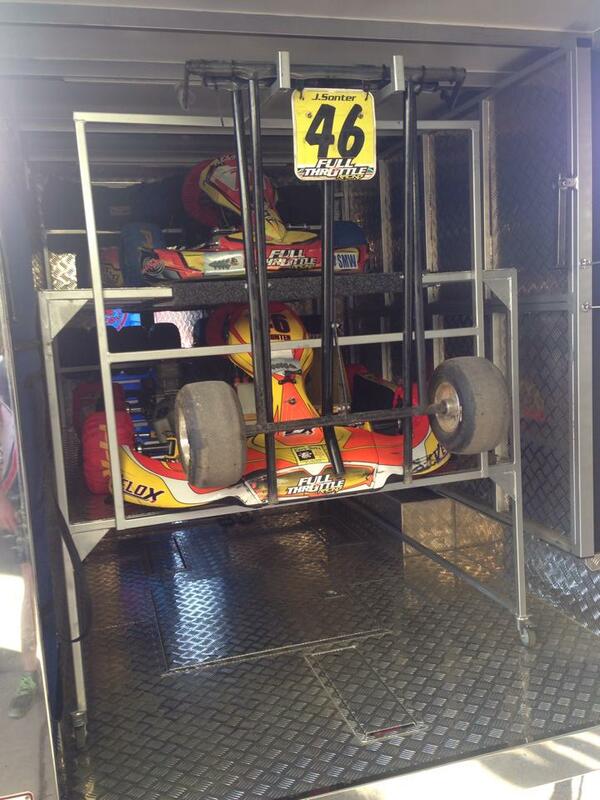 Of course, there are several other methods to get your kart to the track. However, this article shows that there are many affordable viable ways to do it. Take into consideration your personal budget, preferences and the number of times that you are planning to go racing in a year. The goal should always be to find ways to get yourself on the track, not generate ways to talk your way out of it. If you can’t afford transportation right away, start setting goal to save, or perhaps purchase a trailer with some buddies until you’re able to make it on your own. 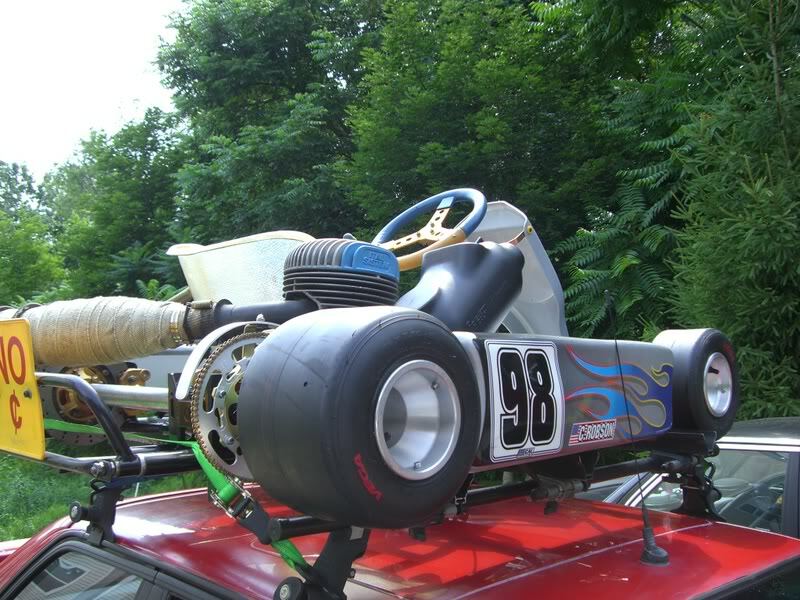 Regardless of how you want to transport it, karting provides the most affordable ways for racers to get to the track and get plenty of seat time. If you really want to find a way to go racing, you will create some method to make it happen. Photo credits to Jacob Janders, Jeromy Sonter, Bill Caswell and Paul McDonough. — Author’s Note: Davin Sturdivant (@relaxeddriver on Twitter) has over eight years of racing experience as a Solo II autocrosser and a competition kart racer. As more articles appear on Build/Race/Party, you can also read more race-craft improvement articles in more detail at his personal blog, StartingGrid.org.